aside	Acting AG Matt Whitaker Will Be Needing His Own Defense Attorney A.S.A.P. Jeff Sessions vs Matt Whitaker . The republican President Donald Trump plucked a lackey out of obscurity due to his critical opinions against the FBI Mueller Trump-Russia probe while he was a frequent flyer on FOX TV and CNN, Matt Whitaker, to temporarily replace the recently fired AG Jeff Sessions, as the Acting Attorney General for the US Department of Justice (DOJ). In other words, Matt Whitaker auditioned for the job. He obviously wasn’t appointed by President Trump because of his high level of integrity. It turns out that Matt Whitaker asked the DOJ’s ethics officials to do an informal evaluation as to whether he should be required to recuse himself from exercising his oversight duties regarding the FBI’s Trump-Russia investigation being led by the Special Counsel Robert Mueller III. He has discounted the same advice from the DOJ’s Ethics Officers that the former AG Sessions felt obligated to follow. Meanwhile there was a press release disseminated to the media that the Ethics’ officials were NOT recommending that Mr. Whitaker recuse himself with anything having to do with Mr. Mueller’s Russia-Trump inquiry. Then the leaks started. Supposedly the DOJ ethics experts had recommended that Mr. Whitaker recuse himself from the Russia probe, but Mr. Whitaker and his right wing cronies weren’t having it. So they decided to do a work-around where Mr.Whitaker would be granted the green light to NOT RECUSE. NO, these actions do not meet the acceptable standards expected from DOJ officials. But this is what happens when the president uses his hiring/ appointment powers to pick justices who have gone on the record, being supportive of President Trump’s complaints that the FBI’s Russia-Trump probe has become a witch hunt where the Special Counsel has exceeded his authority, instead of recruiting and appointing the best qualified personnel. This is how Judge Brett Kavanaugh became the latest US Supreme Court justice based on his 2009 writing, expanding the powers of the US presidency; how William Barr ended up being selected as the latest presidential appointment for the DOJ’s Attorney General position based on his June 2018 unsolicited legal memo that was highly critical of the FBI’s investigation being led by the Special Counsel Robert Mueller III. See Barr document as per Lawfare: Document: William Barr Memo on Obstruction InvestigationNote: It’s my opinion that the Barr memo is not as devastating as news reports are depicting. A closer read would raise the hairs on some supporters of President Trump. The senior official who described the Whitaker discussions refused to identify the particular Justice Department employees involved. 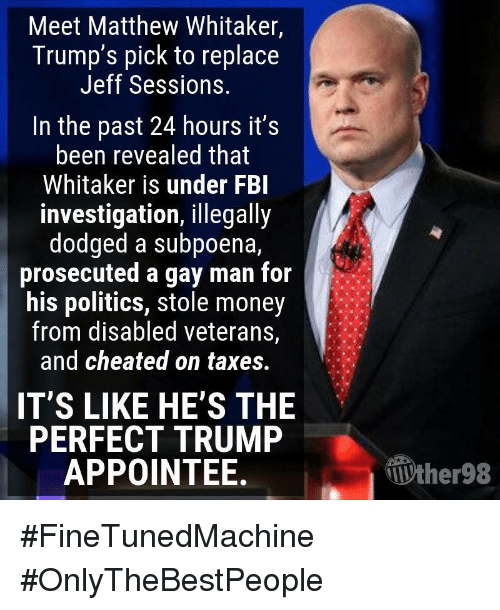 Typically, ethics officials make recommendations that Justice Department employees are expected to follow, but the final decision on whether to recuse over an appearance of a conflict of interest was always Whitaker’s to make, according to past and current officials. For starters, and it’s totally irrelevant and apropos of nothing, but Matt Whitaker looks like a mafia hitman. If there is intelligence in there, it ain’t reaching his eyes. I loved the John Oliver clip … had to watch it twice … best laugh I’ve had in days! What truly low-down, dirty games Trump & his minions are playing with our government. If Whitaker does not recuse himself and if the Senate confirms Barr, then we will have the single most corrupt Department of Justice in the history of this nation. It will need to be renamed the Department of Injustice. We the people better start screaming at the top of our lungs that this will not do, that we will NOT tolerate such abuses of power. 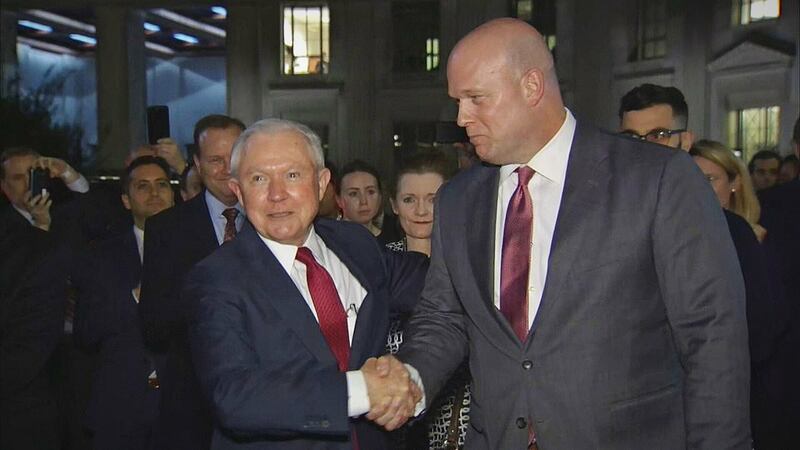 Mr. Whitaker looks like a bouncer at a bar and I bet he works at that look. After all, that look is what helped him audition and qualify for the top law enforcement job as the US Department of Justice’s Acting Attorney General. But even he is not up to the standards of what President Trump’s wants which is someone who will do whatever is possible to derail the FBI’s Trump-Russia probe. 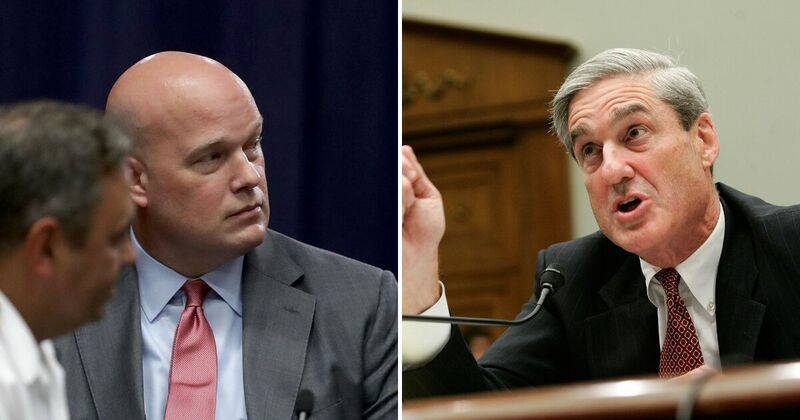 Unfortunately, Mr. Whitaker may not want to end up behind bars like Michael Cohen. President Trump has picked three key peoples for justice type positions based on what they could do for him, Brett Kavanaugh; Judge Barr and Matt Whitaker. Judge Barr may be a sleeper. If one reads his memo that has gotten a lot of attention for being unsolicited and favorable to the president in that it’s critical of the FBI’s Special Counsel Robert Mueller III, he details what could get the president in trouble. It’s obvious to me that Mr. Barr was missing a lot of salient facts when he wrote to memo. The perfect Trump candidate. The Trump swamp is teeming with such. But now President Trump is giving his lackey Matt Whitaker a hard time. He doesn’t get that the AG is not his personal attorney to where he is limited as to what he can do without breaking the law and where he ends up in prison. I pray for that option or God’s divine intervention everyday. I never thought I’d be living in a Manchurian Candidate reality play but that’s what it feels like. 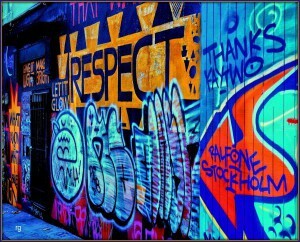 (c) Portions of the ‘serious’ Right of the GOP. He can’t even rely on the ‘nightmare’ scenario of trying to impose an autocratic rule on the USA….